1954’s Academy Award winning best picture of the year was On the Waterfront, for which its star Marlon Brando also won the best actor award. Brando’s co-stars included Rod Steiger, Karl Malden, Eva Marie Saint, and as the film’s memorable bad guy, actor Lee J. Cobb. Lee J. Cobb started making movies in 1934 and continued for 42 years, through 1976. Among his many film credits were 12 Angry Men, The Three Faces of Eve, Exodus, How The West Was Won, and The Exorcist. A low point in the life of Lee J. Cobb came when he was hounded by the notorious House Un-American Activities Committee investigating what it called communist subversion in the movie industry in the late 40’s and early 50’s. Cobb had been named as a supposed communist, but refused to testify before the committee. During this time, his wife suffered a mental breakdown and had to be institutionalized, and Cobb’s career nosedived. Finally, he gave in and appeared before the committee. Shortly after, he suffered a heart attack. During the ordeal, Cobb credited Frank Sinatra with saving his life. When no studio would hire Cobb, Frank got him a part in his film The Miracle of The Bells. In addition, knowing that Cobb was broke, Frank paid his hospital bills, and then opened his home to Lee until renting him a luxurious apartment. And what makes this generosity even more noteworthy is that Frank did all this for someone he barely even knew. 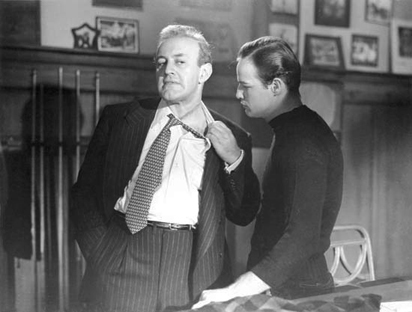 In addition to his film roles, Lee J. Cobb also created the stage role of Willy Loman in Death of a Salesman. And although he was known as a great dramatic actor, he was equally adept at comedy, making his mark as James Coburn’s befuddled boss in Our Man Flint and In Like Flint. And in 1963, he co-starred in another comedy, appearing in the film version of Neil Simon’s first play, Come Blow Your Horn. It was a part he probably enjoyed. He co-starred with Frank Sinatra, playing Frank’s father, in spite of the fact that in real life, he was only four years older than Frank. From the Frank Sinatra Impersonator Blog at WordPress and the Frank Sinatra Impersonator website.